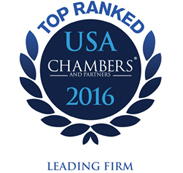 Modrall Sperling is pleased to announce that it has received high honors from Chambers & Partners in the 2016 Chambers USA: America’s Leading Lawyers for Business guide. A total of 18 attorneys were selected in 24 Chambers-defined practice areas reinforcing the firm’s regional and national presence in the market. The firm has once again received a national ranking in the Native American practice area. Lynn H. Slade, Walter E. Stern and Brian K. Nichols are nationally ranked in Native American law.